There are plenty of ways to cook eggs. One of my favourite ways is to simply pan fry them with some vegetables and/or meat. I used bean sprouts and pork the other day. My family was just loving it. The omelette was gone in a few minutes. The dish can be done within 15 minutes as long as you have silver sprouts (銀芽) ready, that their ends are trimmed. To prepare silver sprouts is not that difficult, yet quite time consuming. For convenience, you can skip this step. All parts of a bean sprout can be eaten after all. 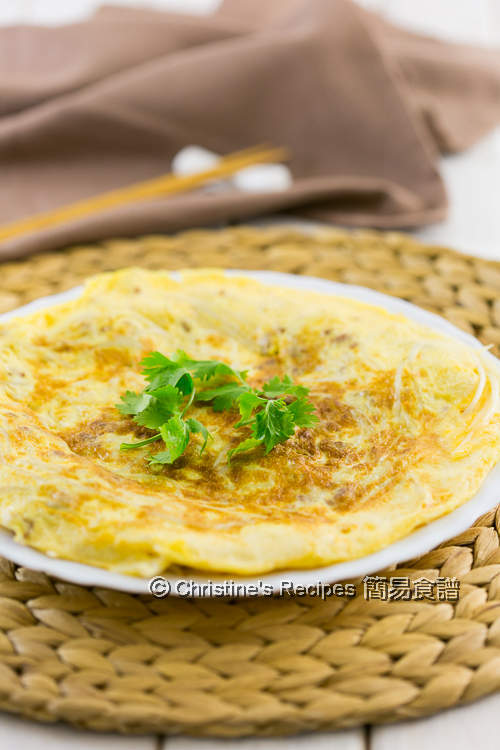 This Hong Kong style omelette dish is best served with light soy sauce and chilli sauce. Trim away both ends of the bean sprout. Rinse and drain very well. Mix pork with marinade. Set aside. Heat oil in a pan over high heat. Saute the bean sprout until wilted. Season with a bit of salt. 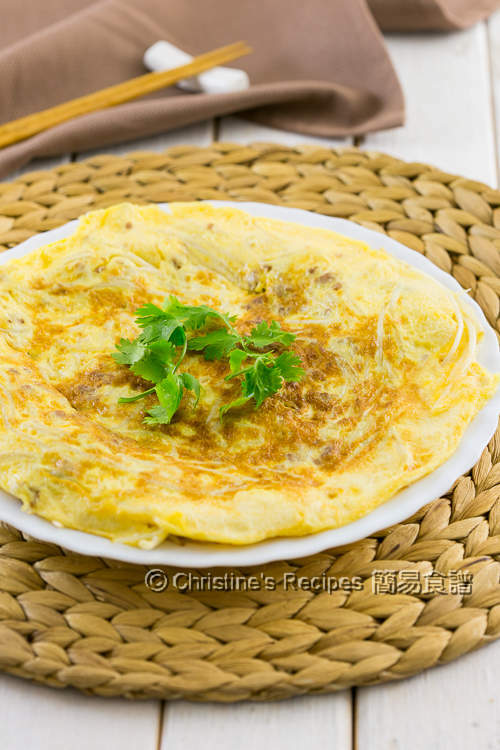 Don’t need to cook too long as you want to retain the texture in the omelette. Set aside to cool down a bit. Reduce heat to medium. Add oil and cook the pork until done. Use a spatula or wooden spoon to break up any lumps. Set aside to cool down a bit. Whisk the eggs. Add water. Mix well. Stir in the bean sprout and pork. Pan fry over medium high heat until both sides are brown. Garnish with coriander. Serve hot. Quickly saute the bean sprout first. Having done that, the bean sprout won’t release any water while frying with eggs. 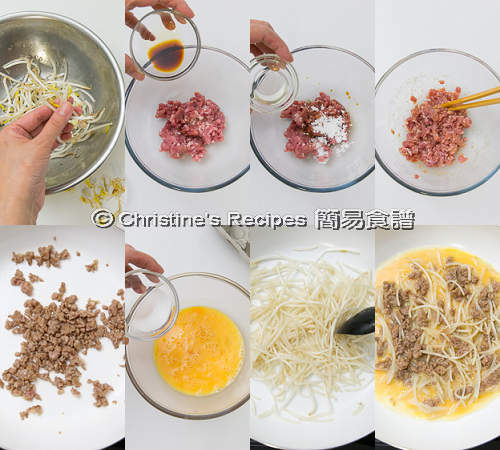 You may pan fry the egg, pork and bean sprout mixture in two or three batches. When pan frying the omelette, it’s recommended to add enough oil to coat your pan. Before adding the egg mixture, your pan needs to be heated nice and hot. Then your omelette will look good and smell fragrant. A homey and very delicious omelette! hi christine, may i know where did you buy the pan and also the brand? i like it. thx for replying. I got this ceramic frypan from Target, Brisbane. It's not a famous brand, but very useful.